The Teen Queens were two African American sisters from Los Angeles, Betty (born 1939) and Rosie Collins (born 1941). 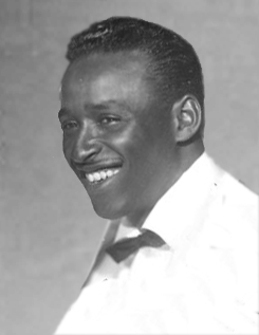 Their brother Aaron Collins was a founding member of the Cadets / Jacks, best known for "Stranded In the Jungle" (1956). This group recorded for RPM / Modern Records and Aaron arranged for his siblings to record for the same label. 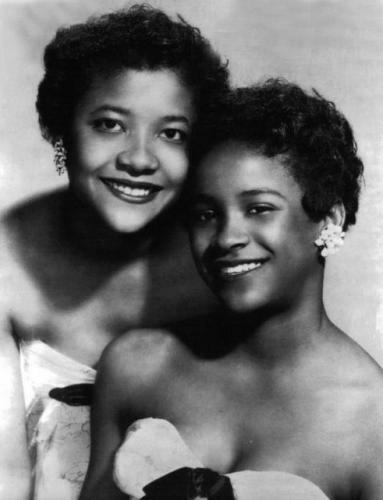 He had written a song for them, "Eddie My Love", which the Teen Queens recorded in December 1955, coupled with a jumping blues tune, "Just Goofed" (RPM 453). Released in January 1956, "Eddie My Love" was an immediate seller, peaking at # 2 on Billboard's R&B charts and at # 14 on the pop charts. Though Aaron Collins had written the song by himself, he had to share composing credits with arranger / conductor Maxwell Davis and one of the Bihari brothers (owners of the label), who was credited as "Ling". This was more or less common practice at RPM / Modern at the time. 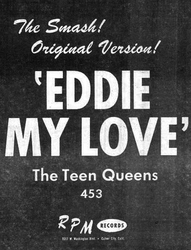 "Eddie My Love" spawned numerous cover versions, two of which also made the pop Top 20, by the Fontane Sisters on Dot (# 11) and by the Chordettes on Cadence (# 14). The song has become a classic of its genre. The follow-up was the very similar "So All Alone", which did not sell well. By this time the group was on the road to promote their hit. They toured in the "Biggest Rock 'n' Roll Show Of 1956", alongside Frankie Lymon, Bo Diddley, Big Joe Turner, Bill Haley and his Comets, the Drifters and others. 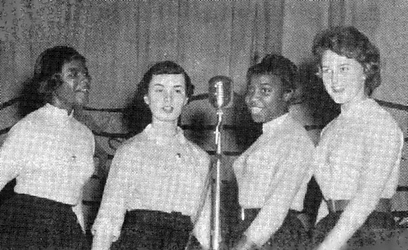 In July 1956, Cash Box picked them as "Up-And-Coming Female Group" in its DJ poll. Yet, by then the hits were already over and the girls were has-beens before they were 18. 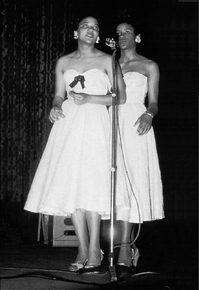 Later RPM singles concentrated on uptempo numbers, which the sisters sang with clarity and gusto. The best of these is probably "Rock Everybody" (RPM 484), a variation on "Rag Mop", released towards the end of 1956. 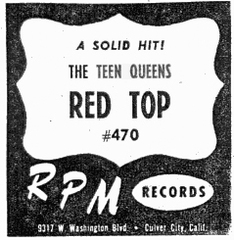 In 1957 the Teen Queens received an offer to record for RCA Records. 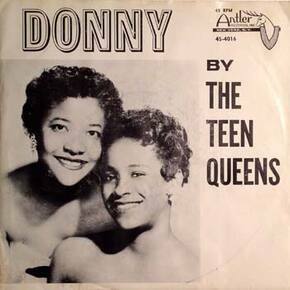 Unfortunately, the label tried to change their image and stripped them of their rhythm and blues style, the factor that made the Teen Queens so popular in the first place. RCA gave them songs like "You Good Boy, You Get Cookie" and "Movie Star", sung in a style so straight they could have been lifted from a Broadway soundtrack. The Teen Queens 1955 ??? The girls left RCA within a year. 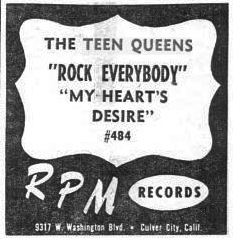 After almost two years of not recording, the Teen Queens made four sides for Antler Records, owned by Buck Ram, whose assistant Jean Bennett became their manager. The first Antler single was an answer to Big Jay McNeely's hit "There Is Something On Your Mind", entitled "There Is Nothing On My Mind" (Parts 1 & 2). Each of the sisters takes her turn singing a line, interspersed with a stern spoken lecture. A far cry from the teenage innocence of "Eddie My Love" (which was reissued on Kent in 1961 and on Lana in 1964). Buck Ram ran the Antler label only as a sideline and "There Is Nothing On My Mind" went nowhere. 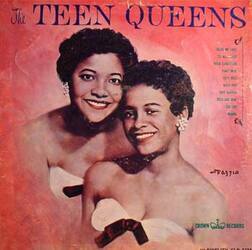 After one more single on Press Records in 1962, as Rosie & Betty, the Teen Queens ended their recording career. The two sisters met untimely deaths. They had started using dope while on the road in 1956 and could not kick the habit. In 1968, Rosie took an overdose of pills and alcohol, went to sleep and did not wake up. Betty passed away two or three years later. One of rock 'n' roll's tragic stories.